In the history of holidays, we see new holidays each year. Some are beautiful, some are nerdy. I leave it as an exercise for the reader to decide which one this is. One of the recent events for the cognoscenti, for those “in the know,” for the hipper-than-thou, is Foursquare Day. 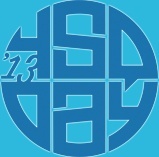 For the tragically hip Twitterati it’s at @4sqday and its hashtag is #4sqDay. 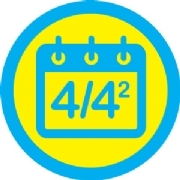 There is even 4sqday.com. Four squared is 4 x 4=16, so 4 / 16 or April 16, 2010 — which was the inaugural date for this eponymous holiday. New York City Mayor Michael Bloomberg proclaimed Saturday, April 16, 2011, “Foursquare Day.” New York joins over a dozen other cities that have already officially recognized the Foursquare fan-created social media day. A global check-in map can be seen here. Foursquare is a social networking system launched in 2009 that uses location-based services to permit people to “check-in” at various locations around the world: restaurants, cafes, stores, parks, museums, clubs, even churches. There are about 45 million users. You can “add” locations if they don’t yet exist in the Foursquare service. As you check-in to a location more frequently, you can earn “badges” to impress your friends and neighbors. With a high enough rank, you can become “Mayor” of a location. 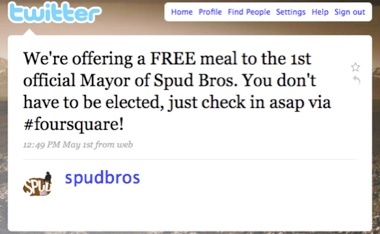 The proprietor of said establishment may offer special perks for the Mayor. 750,000 companies offer such specials. The service has expanded to offering “Explore” which recommends nearby venues showing you places to eat, top sites and attractions. In 2014 the company has split out the discovery from the gaming portion. The Foursquare app is designed for discovery and rating of local venues, but a second app Swarm is responsible for mobile location gaming or “check-ins.” It’s available on the Apple Watch too. After signing up for an account at foursquare.com, you can connect with your contacts from Gmail, Facebook or Twitter. You can add “tips” for what people might do at these locations, or “to-dos” for yourself. After you “check in” you can publish your location to the social “presence” services like Twitter, Facebook, or Tumblr. Brands are using Foursquare to promote their name and generate buzz. Companies are using Foursquare to connect with their customers, and Foursquare has published APIs (Application Programming Interfaces) that permit developers to integrate with their applications. If you use Foursquare (Swarm app) to check-in at more places, and at the same place more frequently, than other users — you might generate the highest amount of points in your area and earn special badges for specific kinds of check-ins. Example: a user who checks into 20 different pizza places can earn the coveted “Pizzaiolo” badge, or the “Swarm” badge for checking into a Foursquare venue with at least 50 other users, like airports. Others will be shooting for the special badge pictured to the right. What happens on this holiday? If you have the Foursquare app on your smartphone — iPhone, Android, or BlackBerry — your GPS chip determines your location by Global Positioning so you too can participate in this holiday. The latest news is on the Foursquare Day blog or Facebook page. While most social networking sites have “presence” systems, where you can set your status, or “what you’re doing,” and many have location-based services, like Yelp, Google+, Facebook, and Twitter — Foursquare rolls all this into a “game,” a competition between friends, a way of connecting with them and seeing their social (and local) trends. Foursquare tells people where you are. If you connect it to your Twitter or Facebook account it tells more people, depending on your security settings on those accounts. By implication, it also suggests where you’re not — like at home, for example. If public visibility of your location or non-location presents a privacy or security risk for you, perhaps you might reconsider getting in this game.